Visiting Ramona Park was a frequent during my early life. One feature was a spot known as The Fun House. During one's trip through the place, there were mirrors that distorted the viewer's image making them look taller, shorter, heavier that their true forms. There were moving floors to contend with, and a pair of slides that patrons slid down while seated on burlap bags. One of them featured a large dip, and the other was a straighter design, and each of them involved perhaps a 90 foot ride. A patron could climb back to the top of the slides, repeating trips down those slopes as often as they wished. One rather unpleasant aspect of a visit to the Fun House was that there was often the stench of urine left behind by less considerate patrons who, unfortunately, tended to use darker corners of the two story structure as a latrine. When my funds were dwindling as I moved from one attraction to another, I often boarded the vessel that conveyed its passengers during a loop around Reeds Lake. Those rides would chew up a good portion of time before my parents would arrive to pick me up for the trip home. I've ridden the Derby many times, and I'd certainly concur that its wooden structure didn't appear to be the most stable structure around. My most memorable contact with the Derby came at a time when Ramona Park had closed for the season. Along with a few young friends, and at a time when we were probably around Junior High age, I was attending an East Grand Rapids-Grandville high school football game. The EGR Pioneer's then played on a field just across the street, and south of Ramona Park. The bumper car rides were always popular and fun, and an up and down, twirly ride, The Tilt-A-Wheel, was well worth one's dime admission. The merry-go-round was, as I recall, an artistic and fairly-heavily-used attraction, though it was one that I regarded as tamer than my taste tended to favor. I clearly recall looking in at Ramona Gardens, and noting that it was a popular spot, though I never ventured into that feature of the Park. Three or four of us decided that it would be fun to scale the fence and to explore the inactive Ramona Park. It was unwisely decided that it might be fun to make a trip, on foot, over the length of the Derby's trackage. That adventure didn't last long, nor was it at all successful, as even the most courageous among our group decided, not more than half way to the peak of the highest part of the structure, that the whole thing wasn't such a good idea after all. It is noteworthy to mention that the aforementioned area where the East Grand Rapids football field was located, was once occupied by a different entertainment venue. Early in the 20th Century, the City's professional baseball team played its home games at a field that was found there. Between the ballpark and the entrance to Ramona Park was a streetcar loop. Streetcars conveyed patrons of both of the venues there, then reversed direction, headed back towards the City's center. The ballpark saw some significant historical events during it's years of service. 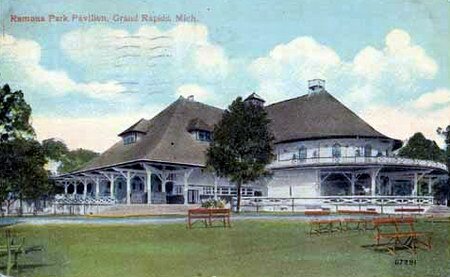 The grandstand had a unique design roughly in the shape of a U. That was, according to reports, a setup calculated to placate local clergymen who were often adamant in opposition to worldly distractions, especially when the Sabbath was involved. The grandstand's design helped to ease clerical fears when it was pointed out that it would provide close-proximity viewing for audiences who were attending revival meetings. But the ballpark had other historic importance. Perhaps most significant among those is that it was the site of what was probably the first night game in the entire history of professional baseball. What has been officially considered to have been the first night game under electrical lights didn't happen until sometime in the early 30's, but the Grand Rapids park saw a games some 20 years earlier when teams from Grand Rapids and Zainesville, Ohio squared off under carbon arc-lights. The game was completed, but not before a close call where one of the players came very near being struck, and perhaps badly injured by a hard hit line drive. I have long believed that a historic marker recognizing the playing of America's first night baseball game should be placed at that site. Before that park was abandoned, a number of famous baseball players made appearances there. One of them was Hall Of Fame member Ty Cobb. Both Babe Ruth and Lou Gehrig were known to have played exhibition games in Grand Rapids, though those visits may have taken place after The City's professional team moved its home to a field that once stood near the Grand River about a mile south of downtown Grand Rapids. How can I contact Ronnie Pierce who wrote on the Reed Lake/Ramona Park page. He was asking if there was anyone who had information about his relative Frances Haskins who was a balloon parachutist during the 40-50's. Thank you. From 1933 to 1958 I lived on Dorroll Street in Grand Rapids. I could see the balloon rise at Ramona Park from our backyard. I couldn't see the parachutist drop but could see the balloon tip over and black smoke would pour out. The balloon would collapse and drop back to earth. A friend and I went to Reeds Lake to watch the balloon launching with the parachutist sitting on a swing bar. The balloon was mounted over a steel barrel with a fuel oil fire which inflated the balloon. I think this was done on Sunday afternoons in the summer in the 1930s and 1940s. Bicycled here when I was 12 in 1947 with a few other adventure-seeking friends from our neighborhood in East Grand Rapids. Went to the park as it was opening for the season. They needed weight in the roller coaster cars to test out the ride. We volunteered, one kid per car. Vividly recall wet paint sliding between fingers, only the lap bar holding me in. Awesome! Family would go annually to see the live Nutcracker performance at the huge theater. Best fun house ever, especially the slides. 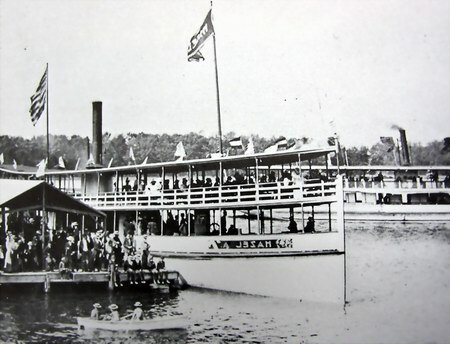 Double-deck paddle-wheeler on the lake. What a place for a kid to enjoy!. I went to Ramona Park around 1954, for a birthday party. Only remember the Fun House and it's hot slides at the end. I took swimming lessons in the 50's from Mr. Reed on Reed's Lake. He only taught the breaststroke on these water wing contraptions. If you swam to the little island in Reed's Lake at the end you got an ice cream float for your prize. Also ice skating in the winter. Fun memories. Re: Roy and Josephine Murphy, my father, Tom Higgins, worked at Corduroy Rubber Company and our family lived next door to the Roy and Josephine Murphy during the years they lived on Giddings. I have many happy memories of them and their children, who were about 15 years older than me. One of their sons, Jim, was my Godfather. They moved to the home on Manhattan, where they lived for the years after. Deb, the amusement park in this area was gone when I was a youngster in the 1950s. It was an attraction in the 30s and 40s when my parents were living in the area but had been closed down near the end of the 40s I think. That's why you don't remember it on your visits to their place. Watching the Pakistani or Indian fellow ascend in the balloon on Sunday evenings and also doing the fun rides bumper cars,fun house and riding the ferry boat sure leaves lasting good memories,Also was a man who made a bet with his friends he could stay perched on the top of a flag pole in Ramona Park for 15 days and the 3rd or 4th day a severe thunder storm came and he had to be rescued by the East G. R Fire department. Seems like this was in the early 40`s. I have just published a book on the history of Ramona Park. It is available at both of the Grand Rapids Schuler Books stores and Papers Plus in East Grand Rapids. It contains hundreds of photos and images as well as much historical detail. Growing up in Burton Heights in the 1940's, one of the biggest treats for my sisters and me was to visit Ramona Park. It all began with a picnic supper on the Big Boat, Reeds Lake. I still can hear the clicking of the steam engine and the player piano on the second deck. Then across the street to the park, beginning with the fun house. The laughing clown, the air hose on the floor, the spinning wheel, the hallway with lots of doors, only one of which would open. Then the grand finale: the indoor slides. 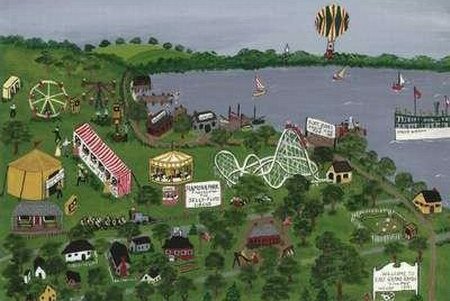 From there it was on to the carousel, the bumper cars, the Tilt-A-Whirl, the Derby Racer, and the little train. I fell in love with the train, pulled by a quarter scale model Hudson steam locomotive. The demise of the park was sad for me. No more lights, sound, and rides. Other amusements had caught the public's fancy. But the little train still ran. I took my daughters to ride it when it was located in Lowell and my grandchildren to ride it at Burley Park. Same locomotive; three generations of excited kids. Were I given one day back from my childhood, I'd probably choose an evening at Reeds Lake and Ramona Park. For me, the experience was pure magic. My father was born in 1918 and I recall him telling me stories of how the Detroit Tigers would play exhibition baseball games at Ramona Park. Does anyone know the year(s) when this would have occurred. I'm a bit late coming back to this page after my last posting. Yes, that is the Roy Murphy who owned the home I was thinking of. Thanks for the info posted on the aerial views. I'll have to take a look! Meredith, your grandparents were awesome. My grandmother was Emma Mervenne. I remember meeting several of Aunt Joey's grandkids when we visited Grand Rapids in the summer. We went to swim with them a couple of times at Cascade CC. Please feel free to contact me at dlh92656 at gmail. com. My Grandfather Peter Porrey played accordion with a band on the weekends at Ramona Park during what I believe was the late 1930's to almost mid 1940's. He went on a boat ride with his housekeeper in Reeds Lake and the boat capsized. Both he and the house keeper drowned. I am looking for anyone who may be aware of the event or know where I can find other information about the incident. Thanks jporrey659@aol. I am the granddaughter of Roy and Josephine Murphy who lived at 640 Manhattan - noted in prior posts as a a possible site for the Beach House. I would love to connect with those who posted about knowing my grandparents. My parents bought the house after Roy passed away. I don't know much about the property but will ask my uncle who lives on the east end of Reeds Lake. In my 1967 Polks Roy Murphy lived at 640 Manhattan, he was the Chairman of the Board of the Corduroy Rubber Co. His wife was Josephine. Before that they had lived at 900 Giddings, near the old Calvin College. A buddy of mine told me his parents built a house on Reeds Lake on Manhattan, I think in the 60s. There is nothing on that stretch of Manhattan on Reeds Lake according to my 1956 Polks but there could have been all kinds of stuff down there left over from the Manhattan Beach days and some of it could have been used to build a house but those are mighty fancy houses down there. There is a web site called Historic Map Works that has 1960 aerials of Kent County, that might show what was down there in the 1950s. I will drive by and take a photo when I get a chance. You can also look up some of the history of the houses in EGR on the EGR web site, they have photos, sketches and a history of every house there. Hi there. I live in Ohio but spent many summers as a kid visiting my grandmother in Grand Rapids. Her best friend, my mom's godmother lived on Reeds Lake in a beautiful lakefront home. Their last name was Murphy. They've both been gone many years but my sister and I were reminiscing the other night and remember that they told us the house the Murphy's lived in was a former building for a popular spot on Reeds Lake. From doing some research online, it appears it might have been the bath house for Manhattan Beach, possibly restaurant or snack bar? The house is on Manhattan. We visited in the late 1960s and early 1970s, but I am not sure how long they lived there, or how long before it had been a house and not a beach! I've search for vintage post cards of Manhattan Beach but can't find anything. 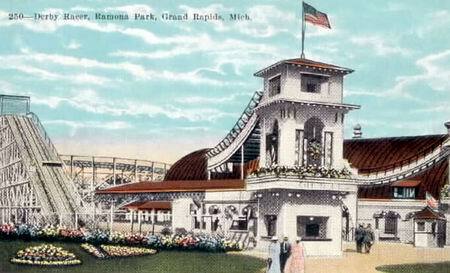 Been finding lots of Ramona Park, but we must not have visited there, because I can't remember an amusement park in Grand Rapids. I've been working on family history for about 7 years, and although the Murphy's weren't directly related, they were a big part of my Mom's and our memories, so I'd love to know more history of Manhattan Beach and how it became a home. Thanks for any help that you can lend! Deb Heim. I remember my mother told a story about how as young girls they would go and hang out at Ramona Park and meet sailors and service men. This was during World War II. She said the one evening when they where there a young sailor was riding in the front car on the roller coaster and at the very top he decided to stand up. Needless to say he fell out and was killed. My mom said that was the last time she ever road the roller coaster and needless to say it made it hard on my sisters and I when growing up we wanted to ride a roller coaster as that memory played over in her mind every time she would see one. She said the Roller Coaster would rattle and shack and you almost felt like it was going to come apart. They also told about how you could go in a little booth and make your own record. My mom said they all had a wonderful time doing it and it only cost a dime at the time. Henry Venlet, Gail Snow 5 posts below is writing a book about Ramona Park. I have corresponded with her several times. I can't wait for her book to come out. You should contact her with your stories, her e-mail address is in her post below. My sister and I use to dance at Ramona Park as young kids. We were dressed up as a little Dutch Boy and Girl. I can always remember after each performance a clown would buy both of us an Orange Pop. We loved going to the park as kids and have very fond memories. I am hosting a site at pointpaulo. com about the resort that was located on Reeds Lake called Point Paulo. The resort hosted actors from Ramona Theater. The site is a Wiki so you can contribute information about Ramona if you'd like. My uncle was one of the pilots of those hot air balloons and several times had very close calls when bringing them down. I, too, went into the fun house - house of mirrors with my dad and was separated from him on the spinning wheel floors. Needless to say, I have not been in a fun house since. Amy Muilenburg, My mother''s name is Margaret and they called her Marg and her sister''s name is Nellie and they moved here from Corsica, S. D. in the late 30''s and they went to dances allot. He maiden name is Muilenberg, but that could be spelled wrong. This is a long shot, but e-mail me. Please visit the East Grand Rapids History Room, upper level, East Grand Rapids Library, 746 Lakeside Drive SE. See pictures, read the Remembering Ramona book with lots of memories from the great days of Ramona Park. Displays change on a regular basis. Please leave a memory of Ramona Park or the good ole'' days in EGR. Questions? Please contact Mary Dersch, Curator, East Grand Rapids History Room, derschmary@netscape. To Linda Phelps and all other folk who loved Ramona Park: I am writing a book about Reed''s Lake and Ramona Park and am looking for stories and photos from people who visited the park or worked there. For more information, see Tom Rademacher''s column in the GR Press from July 4, 2009. My email address is, gmsnow22@hotmail. com. I grew up on Lovett Avenue, across the street for the ''Derby Racer'', which was the name of the roller coaster. The part where the coaster swung up and around was only a few feet away. I remember the noise of the coaster going down the big hill and the screams of the people, and the racketing noise the coaster made as it turned the corner. It lulled me to sleep. My family and the Glidden family were close friends. The Gliddens owned the train and the bumper cars. My parents met at the park, and many years later, they married. I was in the same class as the Delamarter twins, and remember that for our 6th grade celebration, the family opened the park for us. Of course, I could ride most things for free, since the people who worked at the park knew each other. I was taught always to offer money, but it was never accepted. What a wonderful Merry-go-round exists in my memory!I remember Rose''s caramel corn, and the hot air balloons. One such landed on Lovett Avenue after a Sunday ascension, and then, there was the time the donkeys got loose and munched on everyone''s lawns. Didn''t vaudeville end up in Ramona Park? I know I saw some famous entertainers when I was a child, but then I think the theater was turned into a roller rink. I am sure I saw Blackstone the Magician there. There was the fun house and the hall of mirrors, the Tilt-a-Whirl and the caterpillar. I suppose most of this would seem like slow going to the customers of theme parks, but EGR seems to have lost quite a bit of its character when this landmark was demolished to make room for condos and specialty shops. Please visit the East Grand Rapids History Room, upper level, East Grand Rapids Library, 746 Lakeside Drive SE. See pictures, read the Remembering Ramona book with lots of memories from the great days of Ramona Park. Currently there is a display on the Fisk Lake Tavern which stood on the corner of Lakeside Drive and Robinson Road from 1838 - 1955. See the History Room''s website for more information:http://www. eastgr. org/?t=100&c=102Questions? Please contact Mary Dersch, Curator, East Grand Rapids History Room, derschmary@netscape. net. My great grand mother Frances Haskins did parachute jumps over Reed Lake at Ramona Park in the late 1930s or 1040 and I am looking for any information from that time as I only a few pictures and a newspaper article written at the time of her death. I remember in the early 50''s having family Birthday Parties for my Mom on her birthday each year on Memorial Day. The real one May 30th. My Grandma, Verna Jean Jones, hung out at Ramona Park. She died when my Dad was a young boy. I know very little about her. She played in a band, raced cars, and loved Ramona Park. My Dad''s Father was a pinball machine repairman. I wonder if they met at the park? His name was Ronald Benedict. That is all I know about him! It''s a long shot, but if anyone remembers Verna or Ronald I would love to hear from you! Friends of Verna''s that may have hung out at the Park with her were Marge, Nellie, and Short Dort. Pleae view Plafkin Farms on Photobucket. com and Webshots. com. I used to keep a boat with Howard Rose who lived on Reeds Lake. He charged $10. 00 per season, and what a bargain that was. Louis Delamarter was a friend of my father and uncle;we also did quite a bit of business with the Grand Rapids Motor Coach. The removal of the rail lines did a diservice to the general public;in this day of high gasoline prices, we all would benefit if the rail system was in place. We also would benefit if we had an amusement park within the city limits. Today, the John Collins Park provides a sanctuary to rest and relax and enjoy an evening of music in the summer. It is a tribute to the community, that the public access to the lake has been kept opened. Roger Plafkin-Plafkin Farms, Ada, Michigan. 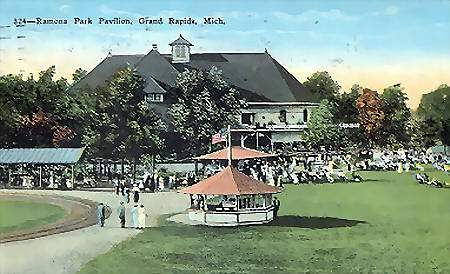 Ramona Park is the most-remembered feature of the bygone days of East Grand Rapids. 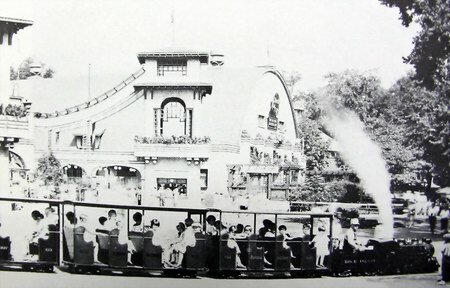 The amusement park, owned and operated by the Grand Rapids Street Railway Company, was a destination spot for thousands of families between 1897 and 1955. It was quite common in those days for a public transportation company to own such parks. They were known as trolley parks, and were placed at the end of the line to attract or encourage use of the public transportation system. During the 1920s street railways were a vital industry that provided the bulk of everyday city transportation in the United States. It was also an industry predominently in private hands, an exemplar of American free enterprise. Less than three decades later, it was an industry in ruins, its traditional suppliers' business dying or dead, its operating companies passing to municipal ownership at public expense. The buses which replaced the streetcars came from a handful of non-rail suppliers, among them Twin Coach and Mack, but predominently from General Motors. Were the street railways bowled over by history as the public turned to a better alternative or were they run out of existence by their business rivals?. Here is some information on the 3 band organs that played on the Carousel at Ramona Park One is now located at The Grand Floridian at the 1900 Park Fare Restaurant, and has been nicknamed Big Bertha. The other organ named Sadie Mae was also owned at one time by Disney World and later sold to a private collector. The last organ is in my back yard in my shop. I am restoring her. If you visit my website you can see pictures of all three organs. www. bandorganmusic. com Thanks Chris Carlisle. My dad's cousin emailed the following: Hi Larry, I must put my two cents worth in as it also was a favorite spot for my family. My dad went on all the rides with me and I loved the one that went completely upside down, but the derby was terrific too. I have pictures in my album from the picture booth where you could get different backgrounds and they were the brown tint inside of all colors like today. What amazes me is I had a dress and coat on and my dad was in a sport coat. Maygbe they were taken after the Theater performance?? I recall seeing Musicals at the Theatre which was special for those days. This would have been 1943 - 1946. When we compare it to Great America or other amusement parks it seems rinky dink, but certainly was a fun place. Cheryl Thank you for jogging my memory !. 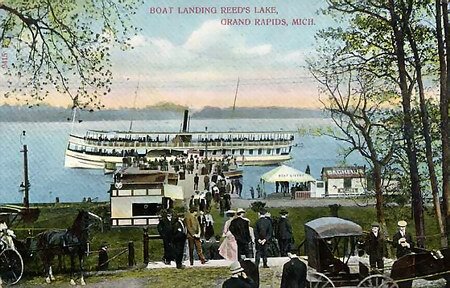 My dad emails as follows: When I was a boy in the 1920s spending a summer day at Ramona Park on Reeds Lake in East Grand Rapids was a great treat. Rides on the Derby Racer roller coaster cost a dime. Then there were the Bumper Cars to drive and try to bump others, the Fun House with it's room of fake doors making it hard to find your way out and the wooden slides which you rode on burlap bags. There was a roller skating rink and many concession stands and food booths. Occasionally a Balloonist would inflate his balloon and take off from the park. There were two small steamers on Reeds Lake which took passengers to Manhattan beach swimming beach at the other end of the lake - a 16 minute ride or you could stay on board for the return trip. The Rampant Theater was also located at the park where traveling stage shows from, Broadway performed. Going to Ramona Park was always lots of fun. I remember my father telling me about all the great times that he had at Ramona as a kid growing up in EGR. Daddy was born in 1929, passed away in the mid 1990s. He told stories of roller skating at Romona and swimming in Reeds Lake. I may have a postcard or two to scan of Ramona. taken from his scrapbooks. More posts later. We just found out that the steam engine and train is operational. It runs on tracks at Burley Park, Howard City, Michigan. It operates only on holidays and for private parties. We were pleased to find this out because we remembered it from our childhood. The Bottom Picture Postcard appears to have been taken from the South East corner of the park, or, perhaps close to Bagley and Wealthy. The First hill ran Parallel to Wealthy street, not far off the roadway. I believe there was a steel picket fence around the park, but it may have been just around the coaster. After the park closed the steam driven train was moved to west of Lowell on the south side of M21 still keeping the name Ramona Railway. I am trying to find out what has happened to this steam train. The train went back to the river, and they also had some small kiddie rides inside of the track the last time I was there, in the mid 60s. There is a newspaper story I read that says the bottom of reads lake is literally covered with ORANGE CRUSH bottles from this period. 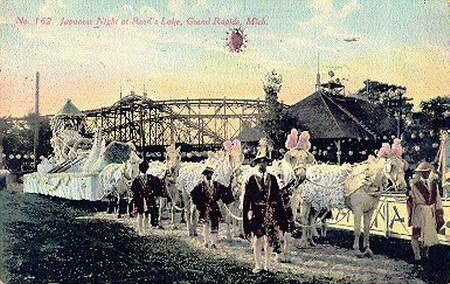 At the turn of the century to the mid 1900s Ramona Park, located beside Reeds Lake in East Grand Rapids, Michigan was a local amusement and recreation area for the surrounding communities. 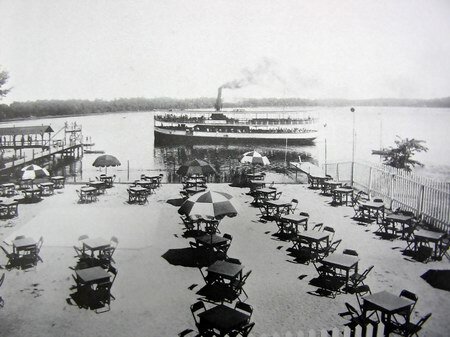 There was a large amusement park, dance hall, theater and steamboat rides.